Planning a trip to O’ahu for the Honolulu Color Run, Mapquest showed the 5K race course just down the street from the Disney Aulani Resort & Spa in Ko Olina. With lodging already booked in Waikiki, near the Diamond Head Crater and the Honolulu Zoo, I popped off an email to the Resort inquiring about a day pass to the swimming pools as long as we were in the neighborhood. Question: I’m coming to Oahu next week from Nov 1-3 to participate in The Color Run just down the street from the Aulani Resort & Spa. While I have already arranged for accommodations elsewhere, I’m interested in visiting the Resort pool area with my seven-year-old daughter. Do you have day passes available? 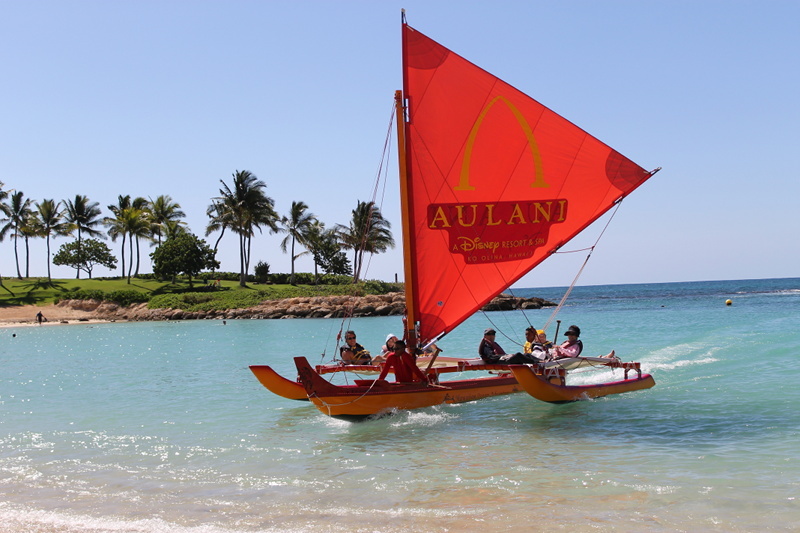 Answer: Thank you for your interest in Aulani, A Disney Resort and Spa. We are excited to hear you will be visiting us! You will be able to visit the restaurants, spa and gift shops which are open to the public. You may also spent a day at the lagoon which would be a public beach. Currently the pool area including the Menehune Adventure Trail, the Waikolohe Pool and Waikolohe Stream (Lazy River) as well as Aulani activities are exclusive to in-house hotel guests only. 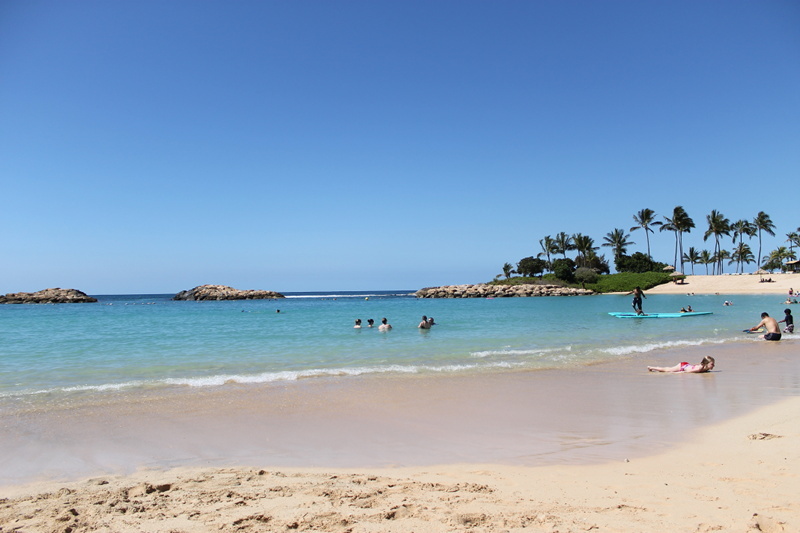 So…we slathered on the sunscreen, rolled up the towels, and set off towards Ko Olina to check out the beach. Securing a parking spot in the public lot at the end of Kamoana Drive, we made a short walk down the paved trail to the waterfront. 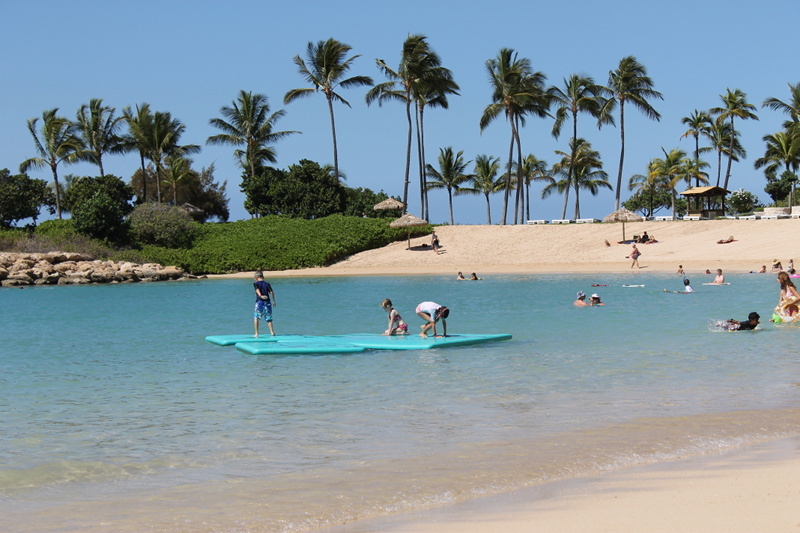 With clean sand, crystal-clear water, and a bay protected from large waves, the Aulani Lagoon ended up being one of our favorite spots while in O’ahu. Surrounded by families with kids of all ages, my daughter happily befriended a boy from Toronto and played to her heart’s content. Away from the hustle-and-bustle of Honolulu and the wavier and more crowded Waikiki beach, the 30-minute drive was worth the solitude.